Taylor Swift's record company has removed her entire catalogue from Spotify, becoming by far the most popular artist to snub the streaming service. Spotify rarely responds to artist snubs, but snapped back with a cringeworthy blog post begging her to return. It's acutely painful timing for Spotify: the company's IPO is likely to bag an enormous windfall for the major record labels who hold equity in the label: a wealth transfer between Silicon Valley and music corporations that fails to "trickle down" to the performers and songwriters who helped create the wealth — they won't see a penny. Swift's new album 1989 is expected to be the year's biggest seller and the accompanying tour to exceed $200m in gross revenue. Rare things are valuable. Valuable things should be paid for. It’s my opinion that music should not be free, and my prediction is that individual artists and their labels will someday decide what an album’s price point is. I hope they don’t underestimate themselves or undervalue their art. Artists less popular than Swift have consistently rankled that back catalogue plays yield far lower rates than before, with the songwriters at the pointy end of the "new economics of music". One estimate of Pandora's statements was that one million plays yielded the songwriter as much as they'd get from selling one T-shirt. Perhaps fewer artists would complain about lower rates if the promise of a global distribution network was fulfilled, and they made up in volume what they lost on a per-play or per-unit royalty. But this hasn't happened. Spotify is the largest streaming service and boasts only 10 million paying subscribers, and 30 million ad-supported subscribers. This is at a time when "over-the-top" (OTT) subscription video services are showing blazing growth, and critics argue that major labels colluded with Silicon Valley to sell out artists cheaply. For its part, Spotify may consider a "premium tier" to satisfy popular artists, rather than a one-rate-fits-all model. 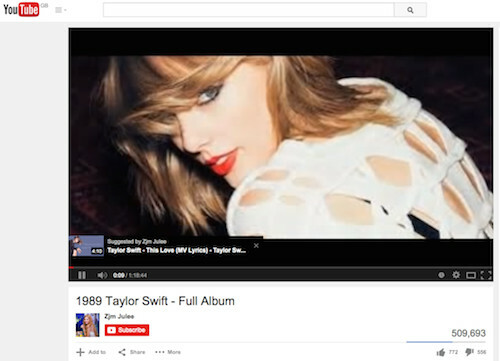 Taylor Swift's entire catalogue is available on YouTube. Google is slow to take down unlicensed material, and thanks to Safe Harbour, "fans" upload it again right away.